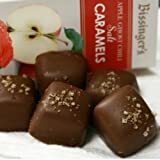 Bissingers Sea Salt Caramels continue to give nod to King Louis\' distinction, using a recipe that dates back to the 17th century. This modern day blend involves the daring taste of tangy apple caramel, topped with a dusting of ghost chili sea salt. The Ghost Chile (Bhut Jolokia) is the hottest pepper in the world, outranking the former red savina Habanero champ. Warm and spicy, these caramels are a delight for chili-heads, but not also extreme for every day chocolate lovers. Includes five Caramels.